Before I get to the recipe, remember me telling you about Charlie Louie from Hotly Spiced and her series on paying it forward? I think that’s such a wonderful thing to do. She’s been making recipes from every blog she features. I won’t step on her thunder but I want to pay it forward too. So many of us sit at our computers or work in our kitchens all alone. We don’t have anyone to offer an attagirl or attaboy. We have to be strong enough to do that for ourselves and sometimes it’s tough. Enter Charlie who’s pointing out the work of some of her favourite bloggers from around the world. What a great way to let a fellow blogger know that their hard work is noticed. Today, I’d like to share my friend Tania from My Kitchen Stories with you. Tania is an accomplished chef, world traveler, mother of one, works at a high-end Italian import company AND produces this good blog. On top of all that, she creates wonderful, quirky cakes. Like this one for her niece the ballerina that needed to be just the right shade of aqua because that’s the birthday girl’s favourite colour. 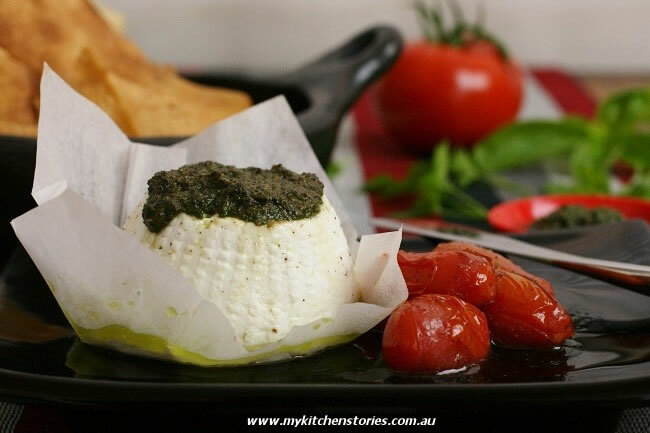 That baked ricotta with pesto up on top is her creation too. Tania lives in Sydney and we’ve met a few times at blogger events around the country but we were fast friends before we were ever in the same room together. She’s a what you see is what you get type of person. When you ask her a question, know that her answer will be from the heart. Recently we caught up at the Eat Drink Blog conference in Brisbane. She arrived early and had dinner with John and me and we laughed all night. If you haven’t met Tania before, please visit My Kitchen Stories. She’s great fun and an outstanding cook, plus — she makes an outstanding friend and who has too many of those? The other day I made some lemon curd and had egg whites left over. I could have made macarons but John’s not fond of them (he’s an idiot, I know!) or I could make one of the few desserts he’ll eat, pavlova. Being the ever dutiful wife, I made the pavlova. Before you think I’m good, I decided on the pavlova because I had three punnets of blueberries in the refrigerator (they are really inexpensive now). I love blueberries. I ended up using one in some muffins, one on the pavlova and the other I sat there and ate the berries one by one. No sharesies. A pavlova is ridiculously easy to make. It’s just egg whites, sugar and a pinch of cream of tartar. Some people use white vinegar to stabilize the egg whites and some don’t use any stabilizer at all. I’ve never tried the vinegar because I’ve been successful with both adding nothing or a pinch of cream of tartar. I don’t use a recipe for meringue or pavlova any more. If you know the ratio for egg whites to sugar, it’s easy! I measure my egg whites and double the number in sugar. For the cream of tartar I measure the egg whites in a measuring cup, divide that number in half and pretend it’s teaspoons. For instance, 1 cup of egg whites divided in half equals 1/2 cup and pretend that’s a teaspoon or 1/2 teaspoon. Have I confused you yet? It seems really simple but then I was writing it down and it seems complicated. I never have a cup of egg whites leftover and eggs all weigh differently. It’s tough to cut an egg white in half. This method works for me. Australians claim the pavlova (as does NZ) but it doesn't matter where it originated, it's a fantastic, light dessert with cream and fruit. Fruit makes it healthy. Figure half the egg whites and call it teaspoons. 1 cup = ½ call it a teaspoon. You'll always be able to make a pavlova or meringues no matter how many egg whites you have. Prepare a large flat baking tray and cover it with baking paper. Trace a circle the size you want and turn the paper over. This will be your guide so you don't have a lopsided pavlova. In a clean, grease free bowl, add the room temperature eggs and cream of tartar and whisk until they are foamy. S l o w l y add the sugar until all is incorporated. Whisk on high for a minute or so and then rub some of the mixture between your fingers. If you can feel the sugar, keep mixing until you can't. Plop the meringue into the center of the circle on your baking paper and smooth with a spatula into a cake shape. Run a small spatula up the sides of the cake all around. This will give the sides stability. Smooth the top and place in the oven for 10 minutes. After 10 minutes reduce the heat to 110C or 230F and bake for an hour. Turn the oven off and let the pavlova cool. Place cream in a bowl and whip until it's thick but not stiff. Cream on a pavlova needs to be really soft.